January 2013 – STU WHO? On Tuesday, I attended the funeral of one of my oldest and dearest friends, Jackie Campbell, in a rather splendid, Humanist ceremony, in a crematorium on the shores of Loch Ness. Jackie was the wife of my long-time, best mate, musical buddy, and philosophical musketeer, Willie Campbell, and their lengthy relationship somewhat mirrored my own with my own wife, Maggi, in many ways … most notably in their fiery honesty, their passionate, opinionated beliefs, and their deep, long-lasting love. A pair of mismatched opposites that just shouldn’t work together … but did … and magnificently so. At the age of 65, after a lengthy illness, Jackie succumbed to cancer, and her passing deeply affected all who knew her … and it turns out, that was a helluva lot of people. Jackie had lived and worked for the past few decades in the small town of Drumnadrochit, near Inverness, on the shores of Loch Ness in the Scottish Highlands. During the years she’d worked as a devoted mother, worked in various hotels, been a very popular, home-help, and eventually worked in a local bakery, and had amassed the widest range of friends, as was evident by the incredibly large and diverse crowd who attended the rather fine sending-off that Wullie and her family had created. From start to finish, it was all rather special, in that the choice of an eco-coffin, beautifully crafted in a cream, basket-weave of wickerwork, was so different from the gothic, dark wooden box that one would normally see. This was further highlighted by the choice of a soft, silver-grey funeral car, led by a young, female, funeral director, dressed in a tasteful, red tartan and black outfit, and totally the opposite of the mournful-faced, man-in-black, undertaker, that we’d normally be expecting. The slow drive along the steep-sided shoreline of Loch Ness gave a true sense of importance, against such a powerful backdrop, and the beautiful grounds of the cemetery and crematorium were a calm and sad reminder of our purpose. The Humanist, non-religious and highly personal, ceremony was such a perfect send-off to Jackie, and a real celebration of her life, her family, her beauty (she once modelled for Vogue magazine), and the deep love that so many people had for such an extra-ordinary woman leading an ordinary life. The respect and love that Jackie had created through her huge extended family and her many friendships, and her straight-talking, no-nonsense approach to life was amply on display, with her favourite music providing a background to the telling of loving stories and humorous anecdotes, from friends and family, creating laughter and tears in equal measure. Willie had written a love-poem to Jackie, which was listed in the order of ceremony “programme” that we’d all been given. I’d read it, and was reduced to tears, earlier that morning at Willie’s house, and was stunned at what a beautiful, heartfelt outpouring of love my old, cynical, hard-core mate had created. Written by William for Jacqualine. There were, also, other beautiful contributions from Jackie’s children and grandchildren, attesting to just how much their lovely granny had meant to all who knew and loved her … and then, as we began to slowly make our way outside, a recording was played of John Lennon’s song “Woman”, with Willie singing the vocals. “Oh dear, this could possibly be a bit a bit weird, a bit dodgy” … cos it’s areally hard song to cover, and to do justice to, as Lennon’s version is so definitive. What a touching, and moving tribute it truly was. Willie and his clan fairly sent Jackie off in style. During my stay in Drumnadrochit I met so many old friends, and lovely acquaintances of Willie and Jackie, and was treated to the warm hospitality of Iona and Lorraine, their lovely daughters, the friendship of Noddy and Blair, and witnessed the warmth and affection that a small, highland community can muster … the assembled mourners of over one hundred guests being catered for, and welcomed, in the local hotel … and all for free … as a mark of the deep respect they too had for Jackie. 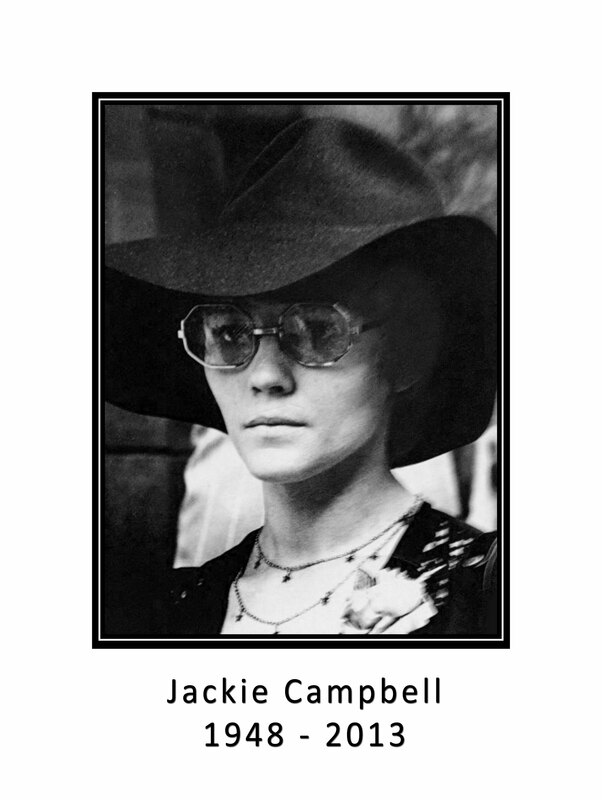 Jackie Campbell could swear like trooper, and had a rich, strident, and colourful vocabulary, with a laughing delivery when belting out her admonitions to anyone who’d dare be disrespectful, or less than kind, in her presence … and that itself was undoubtedly a major part of her delight and her charm. When I learned, just before leaving, that her workmates in the bakery had prepared a funeral tribute which was a baked version of the letters “FFS” … “For Fucks Sake” … I laughed like a drain, and I swear, I could hear Jackie saying – For Fucks Sake – softly in my ear.